Prolotherapy is indispensable when considering biomechanical correction in the treatment of pain associated with ligament laxity. This 51 year old male was referred for assessment and treatment of a 15 year history of chronic low back pain. He had been very active his whole life and had sustained numerous injuries playing a variety of sports including hockey and football. He had been spending approximately $5,000 per year on massage therapy, craniosacral therapy, chiropractic care and standard physiotherapy. He was also put on a variety of medications including courses of anti-inflammatory medications, tricyclic antidepressants for analgesia, and benzodiazepines with no relief. Physical examination identified laxity in his lower lumbar spine at levels L3, L4, and L5 as well as right sacrum. Concurrent examination by a manual orthopedic physical therapist (national examiner) demonstrated a flexion hypermobility at L5-S1, hypomobility at L4-5, hypermobility at L2-3, and right sacroiliac joint dysfunction. X-ray from August of 2006 showed a grade 1 retrolisthesis of L4 to the L5 with suggestion of spondylolysis at L5 and facet arthropathy at L4-5 and L5-S1. 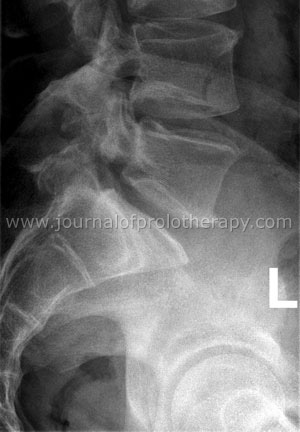 Follow up images from July 2009, demonstrated no retrolisthesis, corresponding with relief of the patient’s back pain. After correction of the autonomic nervous system component of his pain with a German technique known as Neural Therapy (five sessions), and Prolotherapy (five sessions), with concomitant care by an experience physical therapist, his low back pain has been eliminated! He is active at both at work and play, and is off all medications. This case emphasizes the importance of combined treatment modalities, Prolotherapy being paramount, to elimination of even long standing pain. People want to be healed! For many with chronic pain, they are told there is nothing else that can be done. They are told to live with the pain and cope as best they can. This is simply not true! 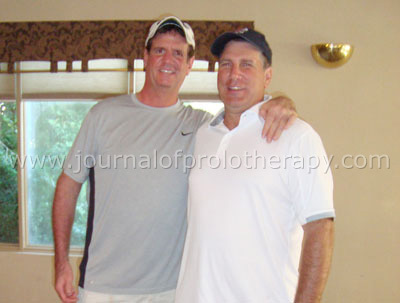 In October of 2006, I saw Freddie Smith with a complaint of at least 15 years of chronic low back pain that interfered with all aspects of his life. He was told by a friend that Prolotherapy might be helpful for him. He had been to a number of therapists, trying multiple modalities and different types of medications used in “pain management.” He was spending at least $5,000 per year out of pocket for these modalities. Quite a sum of money in a country with universal health care where people are not used to paying for any of their health care related expenses. He was skeptical of any other treatments and was anxious about any injection therapies, especially when he had to pay for them. He presented with X-rays from 2006 that showed a grade I retrolisthesis or movement of one vertebra on another at the fourth and fifth lumbar level with associated X-ray damage seen of the facet joints at this level. (See Figure 1.) This is consistent with laxity of the ligaments at this level. Physical examination found tenderness to palpation at the levels of the third, fourth and fifth lumbar vertebrae as well as the right sacroiliac joint. In Canada, a physiotherapist who takes additional training and examinations in orthopedic manual medicine (manual orthopedic physical therapists) is considered an expert in assisting in the diagnosis and recovery of patients such as Freddie. He was also seen by one of six national examiners for manual orthopedic physical therapy who found areas of hypo (decreased) and hyper (increased) mobility in his lumbar spine as well as various factors related to de-conditioning brought on by his longstanding pain. Figure 1. 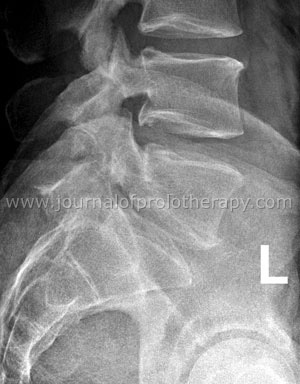 2006 X-ray showed grade I retrolisthesis of L4-L5. Prior to beginning any injection therapies, I believed he would benefit from such care that would only enhance his response to Prolotherapy. While this treatment was ongoing, I began a course of five neural therapy treatments The area of treatment for neural therapy involved injection of 0.5% procaine without preservative and buffered to a pH of 8.0 to areas identified as interference fields. These are areas of autonomic dysfunction. In this case, I used a form of applied kinesiology known as Autonomic Response Testing to localize the problematic areas and treat. They were areas of previous surgical scars that had a role to play in the patient’s appreciation of pain. If you will, the autonomic component or “nerve” component of the mechanical pain with its foundation in instability. This German technique for balancing the autonomic nervous system is, at times, important to deal with the nervous system component of pain sensation. Once the neural therapy was completed, the addition of appropriate physical therapies primed the patient for success with Prolotherapy. The Prolotherapy solution used was 25% glucose with 1% lidocaine and 0.25% Marcaine® at levels L4, L5 and S1. This was done at monthly intervals, three times, and then again on two occasions five months later. At this point, Freddie no longer had back pain, was able to work and participate in sports and was off all medications! His follow up X-ray report showed no associated retrolisthesis consistent with his absence of back pain! (See Figure 2.) The two X-ray reports were interpreted by two different radiologists. Figure 2. 2009 X-ray not reporting retrolisthesis of L4-L5, as was previously reported before receiving Prolotherapy/physical therapy combination. At the time of this X-ray, the patient reported no pain and was able to discontinue his pain medication. Mr. Smith was referred to physiotherapy (manipulative physiotherapist) for low back pain from Dr. Banner, and at that time, had not yet had Prolotherapy. Using the patient specific outcome measure, where Mr. Smith identified sleeping, hockey, golf and driving as important activities, he rated his ability to perform each of these four activities on a separate 5-point scale where four is “satisfactory” and zero indicated “completely unable.” His total score after rating each activity was 1 out of 16, indicating very poor function. On initial assessment, in addition to the hyper and hypomobile segments that were identified, the most striking feature was postural. His lumbar spine was always flexed. (See Figure 3.) A length-tension and strength assessment of his lower quadrant found stereotypical weaknesses that are associated with a flexion pattern of the lumbar spine: short hamstrings, weak hip abductors, gluteal weakness, delayed gluteal firing with leg extension, and a positive active straight leg raise, which indicates poor core stabilization strategies in the lumbar and sacroiliac areas. Figure 3. On initial assessment, patient in his functional stance for hockey. Note the reversal of the lumbar lordosis. The initial six weeks of treatment focused on three main issues: lack of pelvic dissociation, poor hamstring length bilaterally and poor core stability. Improving pelvic dissociation and improving hamstring flexibility were treated with complimentary exercises. Using a hyper-lordotic position in sitting, Mr. Smith attempted to straighten his legs one at time, holding each time for five seconds. Pelvic dissociation was also practiced in standing, with arms straight and hands resting flat on a high bed. He was instructed to repeat each exercise ten times at least four to five times per a day, with the expectation being to improve the endurance of the postural muscles. Improvement of the global core stabilizers like the gluteal muscles and hip abductor muscles are necessary to improve functional core stability through dissociation of hip movements from pelvic movements. Initially, Mr. Smith was only able to lift his knee 10 centimeters with hip abduction/external rotation in a side-lying position, but he progressed to lifting through full range over an eight to nine week period. To improve hip extension strength, he performed a simple bridging exercise, which also improved drastically. Specific core stabilization exercises as outlined by Richardson in Therapeutic Exercise for Spinal Segmental Stabilization in Low Back Pain, 1999, was concurrently initiated. Manual traction to decrease leg pain was initiated at this time, and a manipulation of the right ilium into anterior rotation was performed on seven occasions when the leg length discrepancy was observed. Figure 4. Positioning for a right-sided L4-5 gapping manipulation. Figure 5. At discharge, patient in his functional stance for hockey. Note the maintenance of the lumbar lordosis. I was sitting on the weight bench the other day and it suddenly hit me… I did not feel any pain, tingling in my extremities, shooting pain down my legs, numbness, or pain in my feet. I realized just how far I had come in the last three years. The fact of the matter is I do not know, but I want to relive the journey, if to help someone else who is suffering from similar ailments, or if only for myself, but to understand how I got to this point. I remember, as far back as a young boy, suffering lower back and SI pain. Even in grade school it hurt to sit down, to skate, or run. Back then we were told not to complain, and really there was no one to complain to. Over the years, I played many contact sports: hockey, football, baseball, basketball. You name it, I loved to play it. But all with a degree of pain and lack of mobility in my lower back and SI, which I just got used to. It frustrated me, as I knew it stopped me from being the best I could be and from playing at a level I was capable of, or even moving on to higher levels. I am sure the weight lifting, heavy lifting summer jobs, etc… all played their part, as did, perhaps, genetics. I would have been in my teens when I first saw a surgeon. It left me in a very grey area, I was in pain, but could live with it, and there was no cure. As time went on, I continued to play hockey and baseball, but the pain got worse and made harder to function on the field and on the ice. I also worked out, but even that was painful. It got to where anything I enjoyed doing, from golf to going for a walk, was a very painful experience. I maintained the ability to function, albeit in pain, from my chiropractor. But even his help, after years of keeping me active, could not keep me playing the sports I love and performing day to day tasks, such as cutting the grass, walking, and even sleeping. I had pain going down both legs and feet. I could not drive my vehicle without extreme pain in my legs, feet, and SI. I could not bend over to put my socks and shoes on. Cutting the grass and gardening were very painful. I was only in my 40’s with still no help in sight. I was fortunate to meet a lady who referred me to Dr. Banner’s practice. After our initial consultation, the pain and frustration was so bad I just wanted him to treat me no matter what. Luckily for me, I was in good hands. Dr. Banner first referred me to Rob Werstine at The Fowler Kennedy clinic, which is a first-rate facility, and Rob is certainly a first-rate therapist. It was then, in talking and working with him, I first realized how bad things were and how far I had to go. He had me doing beginner’s exercises which I could not do without help. I remember the long hours spent just to try and squat properly with my bad back. Freddie (on the left) with his golf buddy. It was time for Prolotherapy, and Dr. Banner injected me on my bad side first. I followed that up with lots of hard work in physiotherapy. Then he injected the other side, and again back to the bad side. Then a last set of injections into the other side again. It has been over two years since my first injection. I work out for an hour and a half daily, golf, play pick up hockey, and sleep at night, all without pain shooting down my legs. I can bend over, drive the car (longest drive was 16 hours in a 20 hour period so far), and do the daily things we take for granted without pain. The guidance of Dr. Banner and his Prolotherapy, in conjunction with Rob Werstine and his physiotherapy, has given me a second chance to enjoy the things that made my life fun. Rob tells me my back is strong enough now that I could kick the hockey up a notch, but one thing at a time. I have a handicap that needs to come way down on the golf course, as I only played a couple of times a year, due to the pain. I look back at all the pain, hard work, and therapy, and I realize the one thing that made it all worthwhile was being able to play shinny hockey with my six year-old nephew and his friends, on his backyard rink this winter. I play with no pain, after not skating for two years. I want this to be a letter of hope for people who suffer like I did. There is hope out there now. There are great programs and treatments such as Prolotherapy, and the teamwork with therapists like Rob, offer so much hope to so many. I never stopped working out, even in pain, and was able to workout through my treatments. I am in far better overall shape now and pain-free. I hope someone who suffered or is suffering needlessly, like I did for so long, reads this and realizes there is hope.